The Inspiring Women Luncheon is our largest fundraising event of the year, where 100% of donations raised at the event is allocated exclusively to programs that directly support the women of WWIN. This is a fantastic event to hear from the women of WWIN and make an empowering difference in their lives. Girls Night Out with Seattle Storm! 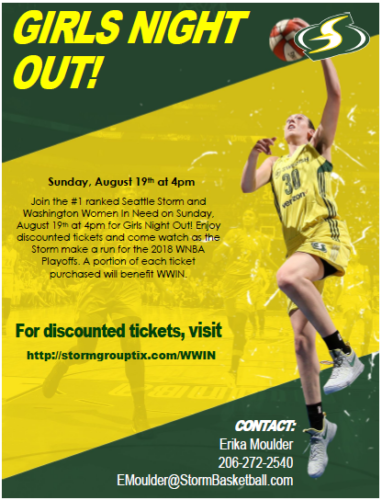 Join the #1 ranked Seattle Storm and Washington Women In Need on Sunday, August 19th at 4pm for Girls Night Out! Enjoy discounted tickets and come watch as the Storm make a run for the 2018 WNBA Playoffs. A portion of each ticket purchased will benefit WWIN.